Breeders' Cup Dirt Mile winner City of Light and Breeders' Cup Classic runner-up Gunnevera may be stabled on opposite sides of the country, but both are feeling quite full of themselves as they begin preparations for the 2019 Pegasus World Cup, According to drf.com, City of Light had his first breeze since the World Championships on Sunday, strolling through a half-mile in 48.80 seconds at Santa Anita Park. “The horse had been asking to work for a week or 10 days, and so went ahead and obliged,” trainer McCarthy said. City of Light really came into his own this year as a 4-year-old, and was the only horse to defeat Classic winner Accelerate in 2018. Initially a Grade 1-winning sprinter, City of Light showed he could stretch his speed in the nine-furlong Oaklawn Handicap and held off Accelerate by a neck on the wire. The son of Quality Road added a third in the G1 Gold Cup at Santa Anita and a second in Saratoga's G1 Forego to his resume before the Breeders' Cup, and has won half of his 10 starts for earnings over $1.6 million. Similarly, Gunnevera will return to the work tab on Saturday, trainer Antonio Sano told drf.com, at his home base of Gulfstream Park West. “He's just so sharp right now I have to do something with him, even though his next race will be the Pegasus and not for another eight weeks or so,” said Sano. Gunnevera's late-driving second in the Classic was another strong effort to add to his 2018 campaign, which also featured a second in the G1 Woodward at Saratoga and a third-place finish in last year's Pegasus World Cup. In March of this year, Gunnevera (Dialed In) traveled to the UAE to contest the Dubai World Cup, but emerged with a serious hoof injury that necessitated months of recovery. His Breeders' Cup run appears to show that he's returned to top form, and Sano likes his chances on home turf for the Pegasus at Gulfstream with the earner of over $4.1 million. Others reported to be under early consideration for the 2019 Pegasus include: Accelerate, Leofric, Patternrecognition, and Seeking the Soul. 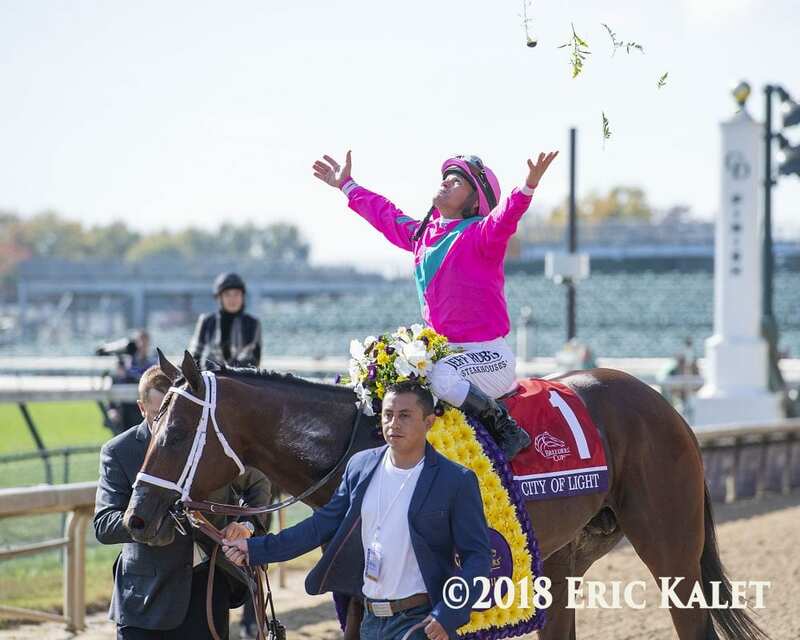 This entry was posted in NL Article, Pegasus World Cup and tagged accelerate, Antonio Sano, Breeders' Cup, breeders' cup classic, breeders' cup dirt mile, city of light, Gulfstream, gulfstream park, gunnevera, mike mccarthy, Pegasus, pegasus world cup by Paulick Report Staff. Bookmark the permalink.